A history of warfare · One Book. One Author. One Hour. Notes on half-title: Hitler-Clausewitz, Marx, Blitzkrieg, Japanese--war machine. Vietnam--Ho Chi Minh-Sun Tzu. Freud. Tito, Mao, Ho, Napoleon, Genghis Khan, Hitler. Underlinings/notes: Underlinings: Keegan's background/education, career, about warriors, war, soldiers. Napoleon and Clausewitz, slave soldiers, warriors from Muhammad, samurai impact of war. Movement away from war nature of men. Notes: "Balliol, Sandhurst," "Winter Bridgman book is dedicated," "limp," "Spell," "Medals," "Uniforms," "Clausewitz death, Marx death," "Nuclear," "Western culture vs. Asia, open v. closed," "Warriors," "Future peacemakers." 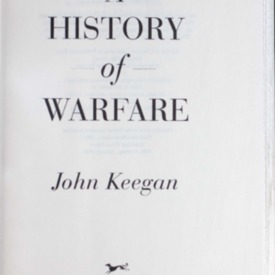 Keegan, John, “A history of warfare ,” One Book. One Author. One Hour., accessed April 24, 2019, http://booknotes.gmu.edu/items/show/264. Program air date: May 8, 1994.